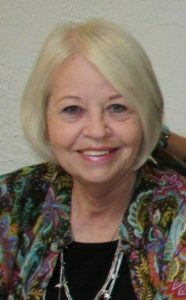 Ann Elizabeth Smith, 74 a resident of Pearland, TX for 23 years, passed away April 9, 2019. Ann was born to Tryon “Bud” and Erma Lea Lewis on June 3, 1944 in Corsicana, TX. Ann Elizabeth “Betsy” Smith was a beloved Wife, Mom, Mimi, Sister, and Friend. Betsy was married to Wes for 33 years. There love spanned decades and even death. You could open any cabinet in her home and there was a love note from Wes. Betsy was well known for her long term and long-distance friendships. She would go out of her way to make sure cards and gifts were sent, no matter the cost or time. If you were Betsy’s friend you knew it, as it was a lifelong friendship. This was the same with her grandchildren, she always made sure there were Halloween treats, Easter baskets and bunnies, and time spent making cookies, cakes, or baked items. Everyone one of her grandchildren had a special dessert they loved of hers. Betsy’s love for her cats was resolute, so much to the point, there were times she would not go out of town for events when she was unable to find someone to cat sit. She also enjoyed making flower arrangements for weddings, painting and doing arts and crafts. She so often painted murals on walls for nurseries that she had a full photo album of her special work. Betsy will be missed in so many ways as she brought light and love to everything she touched. Ann reunites with her husband of 33 years, Wesley Earl Smith Jr. and her parents. Ann leaves behind her sons: Wesley Earl Smith III, wife Sandra and Tryon Cody Smith, wife Kelli; grandchildren: Kayla Smith, Wesley Smith, Drayton Smith and Daphni Smith; great grandchild, Laurel Gleckler; sister, Barbara Marie Southern; brother Tryon Dexter Lewis, wife Trudy. There will be a visitation from 2-4pm Thursday, April 18, 2019 with a service to begin at 4pm in the chapel of Crowder Funeral Home in Pearland. In lieu of flowers, please make memorial contributions to: ASPCA, 1-800-628-0028 aspca.org on Ann’s behalf. To Wes “Trey”, Cody and family. I am so sorry to learn of the passing of our dear friend Betsy. She was a fine lady and a true friend. She always had something good to say about everyone and I will always remember her laughing and having a good time. I remember Betsy and Wes and the fun we all had on Deer Lick Dr. A special memory of mine was when we visited y’all in Loma, CO and Wes took us off “lands-end” in the Cherokee and that road scared me to death. Then the following winter we received a post card from Betsy of the Colorado National Monument and on the back she wrote, “you haven’t lived ’til you go off lands-end in the snow”! I can see her laughing as she wrote that card. I will miss her more than I can say but I will take comfort knowing that she is with Wes and her family. Our thoughts and prayers are with you and your family. May she rest in peace. We have all been blessed to have had a share of Betsy’s life. My life was so enriched by our 66 year long friendship, and with her passing there will be a big empty spot in my heart until we meet again. Rest In Peace my dear friend, and know that you will be sorely missed on this earth. I met Betsy through my wife Donna and we became friends pretty quickly, both being West Texans. Betsy sent me a funny birthday card early on and this started many years of exchanging cards…we probably started looking for cards a year early in order to try and outdo each other with our so-called punches. Betsy had great humor and always a big smile that I’ll remember always. I’m happy that Betsy is now in perfect health and with her beloved Wes. Thank you so much foe sharing your time with you Mother with me. I am so sorry I could not be with you at her celebration of life. She lives in my heart with those piercing blue eyes and her infectious laugh. She loved her family so much.